The list of animals that can damage your lawn includes moles, gophers and the family dog. If dog spots are ruining the appearance of your carefully cultivated grass, remedies are available. Not all work well, so before you start putting gypsum on your lawn, examine all your options. 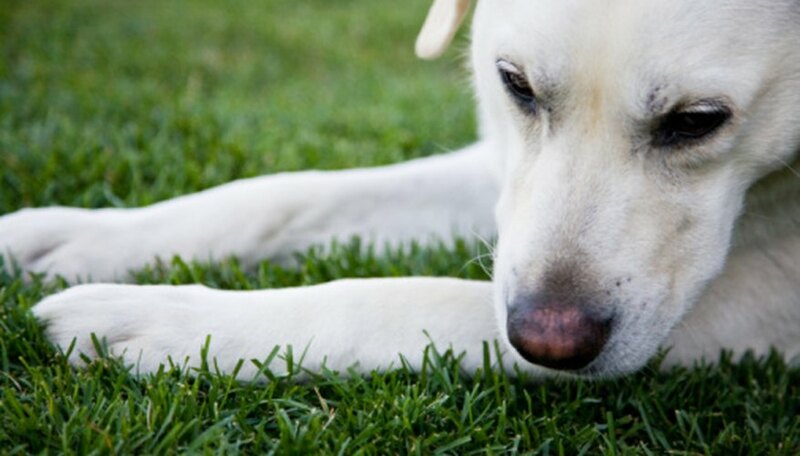 Dog spots are a form of lawn damage caused when a dog urinates on your lawn. A dog's urine contains high levels of nitrogen. The nitrogen is strong enough to hurt grass directly exposed to it. Dog spots are easily recognizable: a circle of brown or yellow grass that appears burned, surrounded by a ring of intensely green grass. A dog that repeatedly urinates in the same place can eventually kill the grass in that area. Several solutions that don't really work are often recommended for dog spots on the lawn. Some suggestions include adding gypsum or lime to grass on which a dog has urinated. There is no proof that this helps prevent dog spots, although adding gypsum might improve soil quality and help provide for healthier grass that better stands up to dog urine. Other suggestions include modifying a dog's diet to change the pH of its urine or to make it drink more water, thus diluting its urine. Ideally, you should stop dogs from urinating on your lawn. If your dog is the one causing the dog spots, train it to urinate in a designated area landscaped with dirt or gravel, will will not be harmed. Put up a fence to keep other dogs off your lawn. If neither of these options is feasible, then try lightly watering your yard after a dog urinates on it. Water dilutes the nitrogen before it can damage your grass. It can even cause the nitrogen to have a fertilizing effect instead. In most cases, damaged grass recovers given enough time. Reducing the amount of nitrogen fertilizer you use on your lawn can make managing dog spots easier. Never make a radical change to your dog's diet without first consulting your veterinarian. Some changes can put undo strain on a dog's kidney or trigger health problems like bladder stones. In extreme cases, damage caused by dog spots cannot be repair. The only solution is to replace the dead area of sod with new.